I am happy to open up my expertise in making archival, fine-art prints and reproductions worthy of portfolio presentation and display for fellow visual artists looking for a gallery-quality print of their own images either for personal enjoyment or for sale to clients. The prints that I produce are from inkjet technology; this is sometimes called giclée printing. 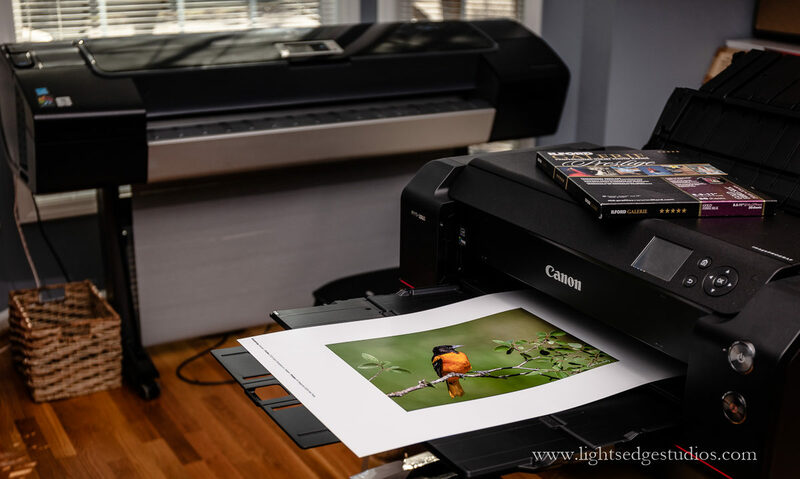 You do not have to be a professional photographer to have a desire for better prints than what you can find locally or even from online labs. I stock a small selection of papers hand-picked for their unique qualities. You’ll find my price schedule includes “typical” photographic sizes, however most sizes up to 44″ in width and 85″ in length are possible. Please ask for a quote for a printing other size files. Also, while photography is my core business, I have experience printing other forms of digital art as well as prints of paintings. I strive to make prints that closely relate to what we see on-screen for both color and black and white photography. The nature of backlit screens vs. reflective media means that they’ll never be identical, but they should be very similar. Before printing I soft-proof and tone each image in a color-managed workflow that is calibrated and profiled from end-to-end with an Eye One colorimeter for my proofing monitors and an Eye One spectrophotometer for building custom paper profiles. If you are interested in having a custom profile made for your own paper and printer, please get in touch for a quote for the service as well as detailed instructions. All prints are created with HP and Canon inkjet printers using pigment-based inks for impressive print longevity: under UV-filtering glass, your print may not show any signs of fading for more than a century. This is a fundamentally different technology from type c “chromogenic” prints made using lasers on traditional silver-halide photo paper (Lightjet, Lambda, Chromira are common brands of the actual printers). For instance, if a lab is printing on Fuji Crystal Archive or Kodak Endura paper, that means it is chromogenic. While the results can look very good, the prints do not stand the same test of time as inkjet prints made with pigmented ink. However, both technologies create prints with significantly greater longevity than inkjet printing with dye-based inks. And while UV-ink printing is exciting because that technology allows an image to be printed on virtually anything, whether those prints will fade before our eyes is a question mark. For more information about print longevity, Wilhelm Imaging Research in Grinnell, Iowa is an excellent resource. I primarily work with papers from Ilford, Canson, Canon, HP and Epson. I do have some sizes of other papers, including a cold press paper that creates a watercolor effect as well as a metallic luster paper (which is not quite the same thing as a “metal print,” which is a photo on metallic paper that is then laminated onto a piece of aluminum). If you’re interested in these or other papers, or if you own a paper you’d like me to use, please let me know and we can make arrangements. Luster photo paper is an excellent surface for most color and black and white photographs. The finish is nowhere as reflective as a traditional gloss, and it allows for very deep blacks and punchy colors. Ilford Gold Fibre Silk paper has a baryta-base (just like darkroom photographic papers) with a subtle sheen to the surface that allows for deep blacks and brilliant colors. This is a heavyweight paper that feels as luxurious as it looks for in-hand viewing. I personally feel that images look a little more “three dimensional” on this paper. It is what I often use when printing my own work to hang in galleries. Moab’s rag matte paper is luminous and yet its fine texture ensures that the paper does not draw too much attention to itself. For a matte paper is has deep blacks, but if a true black is important for your work, a matte paper is unlikely to be the best choice. Canson canvas delivers fine detail (surprising for a canvas) and I’ve been very impressed with the depth of colors that I can achieve upon lamination. Please allow for two days between the receipt of your digital files and the time that your order is delivered (or available for pick up) or in the possession of a delivery service (USPS Priority Mail is my preferred method for shipping prints). I give each project the time it deserves, and sometimes that means re-printing until I get an image I am confident you will be proud to call your own, and it also includes 24 hours for the prints to cure before packaging them for travel. 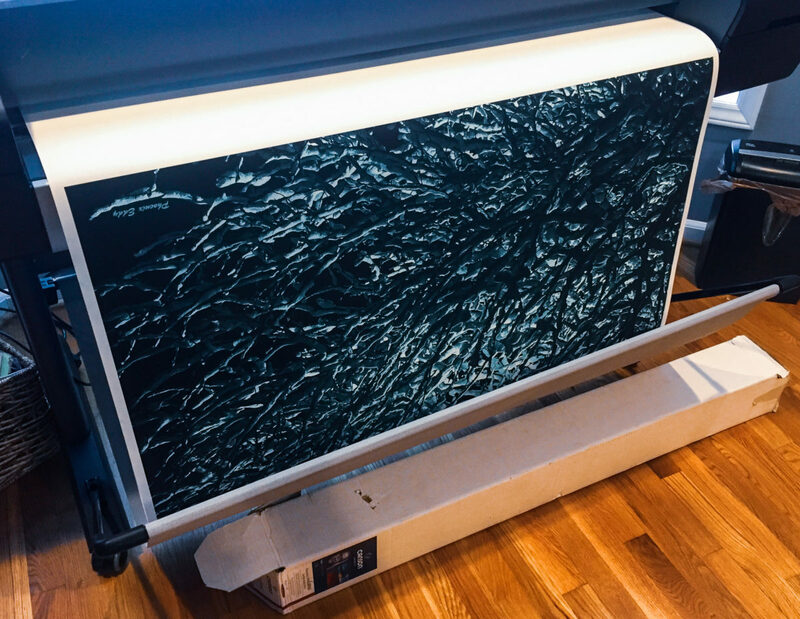 Ideally, you will have the time to wait an an additional day after delivery of the prints before you mount or frame them. 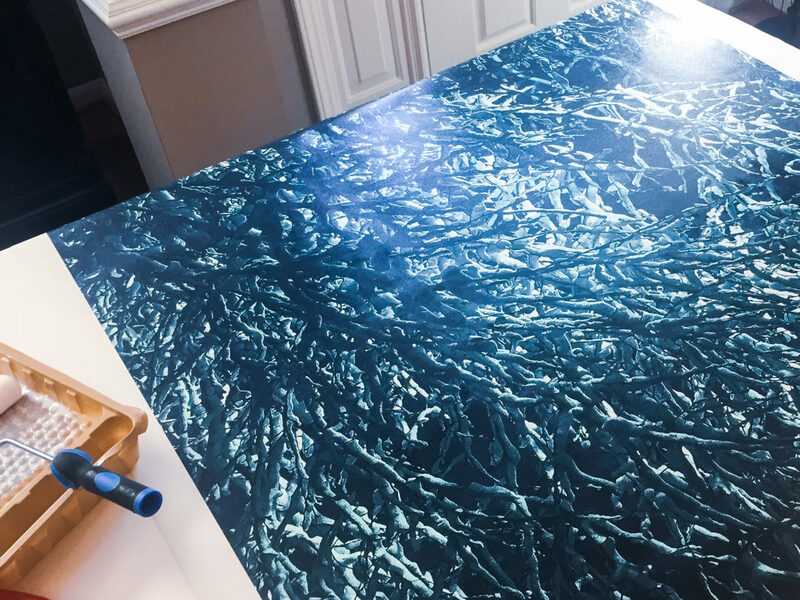 Laying the prints out on a table with pieces of plain copier paper on top of the printed image will accelerate the process while protecting the prints from dust. Ideally, allow the prints to rest overnight. If the copier paper buckles, it means it has absorbed moisture from the print, and may require a new piece of paper to serve as an indicator. 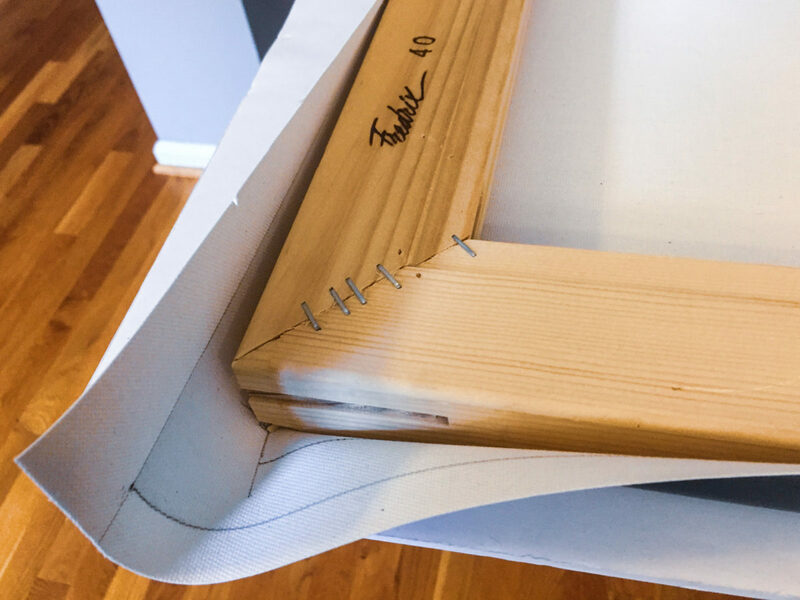 If a new piece of paper does not buckle after a few hours, it would indicate the print is ready for framing. No buckling with the original layer of paper would also indicate the prints have cured. I will conditionally accept rush orders with a 25% fee on top of the order total. Rush orders will not receive the same amount of time to cure before their delivery to you, as the goal will be to print and deliver as quickly as possible. As a fog can appear on the glass if a print is framed too quickly, please do not frame the prints until they have been in your possession for at least 24 hours as this will allow time for the prints to fully cure. Please allow one week for the delivery of canvas prints, especially in the spring, summer, and autumn. Relative humidity affects the time required for the inks to cure before the UV and waterproof protective gloss coating can be applied. I use Premier Imaging Products’ Eco Print Shield, a water-based coating technology manufactured in the United States. Canvas prints are their own frame, so the sides can be mirrored images or a solid color (black is a classic, but it is up to you). 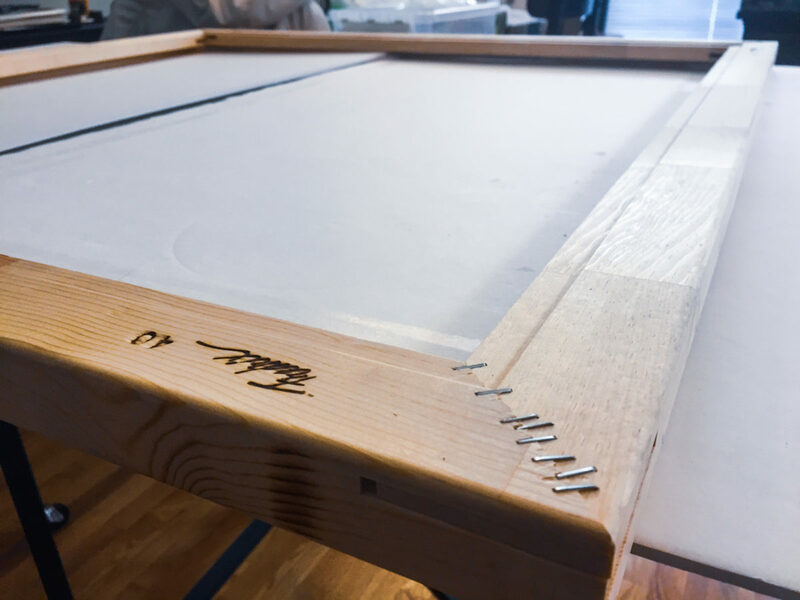 Only after your canvas print is coated can it be mounted to stretcher bars. I tend to use stretcher bars that are at least 1.5 inches thick to give the print a greater presence on the wall, but more shallow stretcher bars are available. 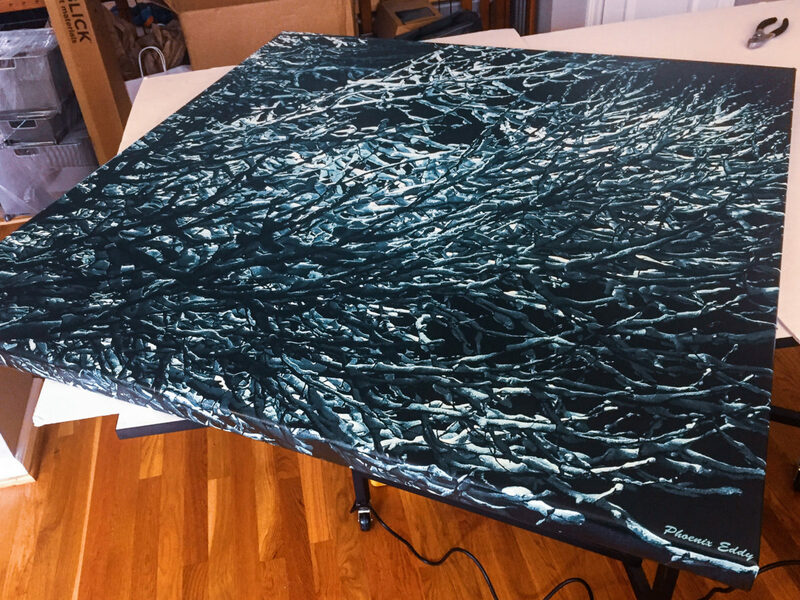 If you are interested in performing the final assembly of your canvas print yourself with your own stretcher bars (I strongly recommend you use an electric or pneumatic staple gun), please ask for a quote for only the coated canvas print.